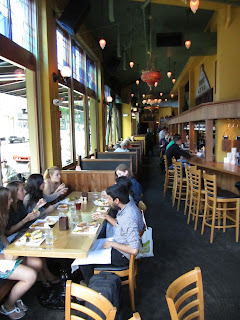 McMenamins really put their back into the rehabilitation of the old Club Portland building into the new Crystal Hotel and its ground-floor Zeus Café. Perhaps to draw a clear contrast with the run-down gay bathhouse that most recently occupied the location, the Zeus is a lot tonier than the usual McM's place. It's quirky, for sure, but in a fancier way than even the crown jewels of the chain like Edgefield or the Kennedy School. In addition to the decor, another place you'll notice the difference is the lunch/brunch menu, a simple half-sheet of paper with no whimsical allusions to the Grateful Dead or other colorful characters, no tater tots, rather dishes (and prices) aimed at a well-heeled clientele. The dinner menu is even more abbreviated and spendy, and the wine list is far more extensive than all the food menus combined. 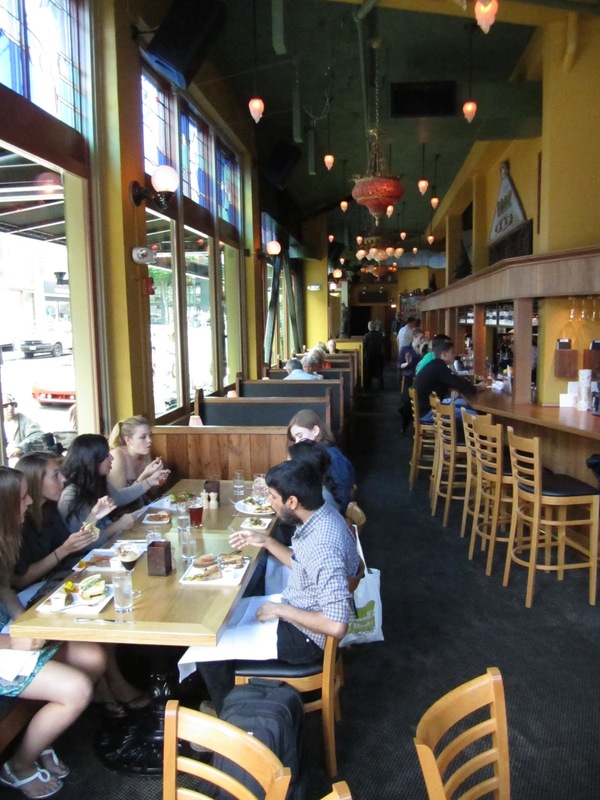 At first all this is a little jarring, but it makes sense when you remember that the regular-folks McMenamins atmosphere and menu is available one block down at the Crystal Ballroom. No need to duplicate that at the Zeus, better instead to compete with nearby grown-up restaurants like Jake's and Henry's. There is a darker bar in the basement called Al's Den, which opens at 4 PM, but its menu is a subset of the upstairs food. The beer for the Zeus is brewed, as you might expect, down the street at the Crystal Ballroom (here's a previous post with more details on the McMenamins sister-pub network). 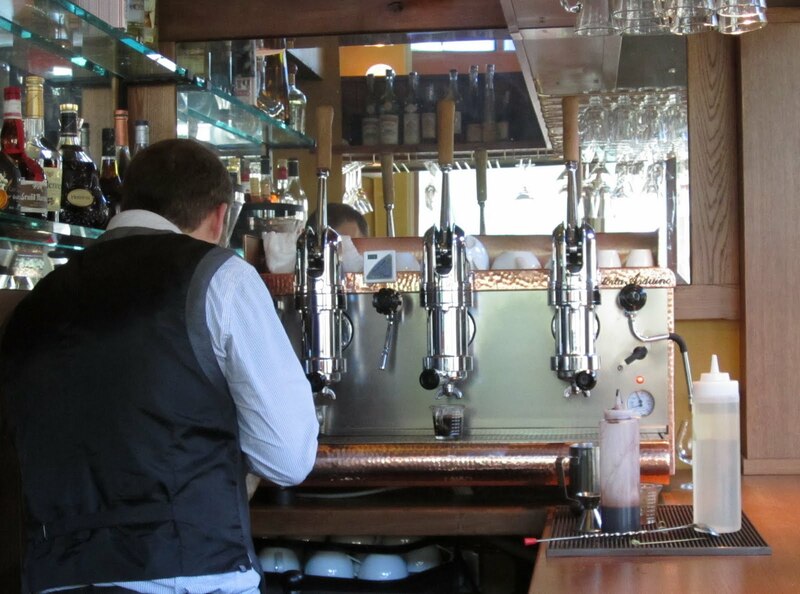 Since I was just musing about wines on tap the other day, I'll note that the McMenamins house white wines at the Zeus are served from CO2 taps -- they don't do the red wines that way because the wine kegs sit in the same cooler as the beer kegs, which would be too cold for serving the reds. Another fancy beverage touch that was added was a sweet Victoria Arduino manual lever espresso machine (at right). The Zeus is a nice place in a great location, it will be interesting to see if they stick with the somewhat upscale hotel-restaurant menu or trend back towards the McMenamins house style. Further reading: check out the Portland Mercury's take on the Crystal Hotel remodel. Bout time MCM's stepped it up a notch. Their traditionally stale and low brow menus are so tiresome and the food incredibly lackluster and cheap tasting. Might be nice to have a menu that's in-between high end and their ghastly, current, trailer park offerings. I think even their beer has improved more than their food, and that's not saying much. All that said, I've had a decent meal at Edgefield's Black Rabbit. Decent, not great. The real question is whether the beer will be up to snuff. If it was even reliably average, I'd end up at McPubs more often--they're so cool to sit in. But I've had a couple undrinkably bad beers in 2011 and it gives me pause. The McMenamin properties are often very interesting, eclectic in architecture and artistry. All properties seem to have so much to offer in lodging and aesthetic appeal. It's a sad fact that that's where their efforts stop. Food is horrible. Beer usually doesn't even hit the Average mark. Their extensive wine selection could be narrowed down to handful of drinkable selections. Most services and dining options are overpriced. They're distillates may be the best made beverages they serve. I find it depressing that the McMenamins take the time to build a beautiful Carousel, but never ride it to acquire the brass ring. They just sit on a bench and watch the pretty horses go in circles. @Jeff: Did you have undrinkably bad beers at Ringlers/Crystal? Because that's who is supplying Zeus. My opinion is that Crystal turns out very typical McM's product -- not terrible and not exciting. @Dr wort: Well put. It puzzles me why McMenamins even stays in the beer game, given their disinterest in playing it well. There are some talented brewers in the chain, but it's not because of any management decision, it's just the number you'd expect after rolling the dice enough times. @Bill: MCM Brothers don't even publicly announce themselves owners of a breweries or wineries or whatever. They say they're restaurateurs! Yea, I know, That's just as funny! That's like saying Velveeta is Cheese!!! AS you know from reading my long-ignored blog, I refer to all MCM properties as MCMediocre, which pretty much sums up the MCM kingdom. BTW, most McM brewers are what I call "Mop Bucket Brewers." One day their pushing a mop-n-bucket; The next day they are the brewer. It's a strategic control thing. Take someone who knows nothing...Get them interested... Teach them to be "Button Pushing Brewer" but don't really give them any brewing knowledge, just the ABC steps to do it. This in turn keeps their brewers happy to make any damn thing the McM's want... No matter how boring or insipid. Then, if that brewer actually learns something and wants to stretch his legs and be innovative... Hit the bricks or back to the bucket. Very basic corporate control methodology. You know why McM's beer and food never improve? Because there are too many people out their that except the mediocre food and drink. If I was one of the McM brothers I wouldn't change a thing either. Let em drink the swill and eat the garbage, as long as they come with money in their pockets and choke it down. I'm sure the McM Brothers are sitting back, smoking a joint, listening to the Dead and laughing all the way to the bank. Think about that next time ur buddy says, "I want go to Kennedy School and have a Hammerhead."